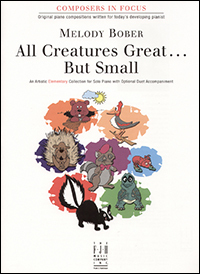 This delightful elementary level collection of solo piano pieces provides students with a sense of different musical styles through imitating the sounds of a variety of critters! Students will experience crossovers, varying dynamics and articulations, octave changes, and a little interesting fun fact about a critter represented in each song title. Each selection contains an optional teacher duet part that enhances the overall style and mood of each piece. 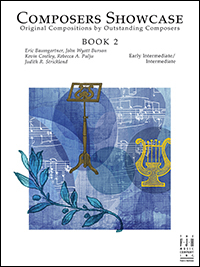 Composers Showcase, Book Two is the second volume in the series highlighting the works of a variety of talented composers. 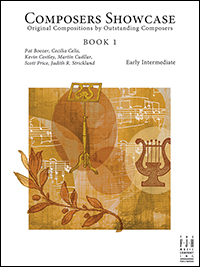 Perfect for recitals, you can also select these pieces for the early intermediate student who needs extra repertoire. Every teacher's library should include this delightful collection! Contents include: Mojave Moon; Top Secret; Beneath the Stars; Country Dances, Set II; The Factory Tour; Ghost Town; and Desert Sands. In the third volume of the Composers Showcase series, this collection introduces the pianist to a variety of pieces - each one reflecting the individual styles of the composer. Intermediate students will enjoy performing these compositions at recitals or playing them as extra repertoire. An outstanding addition for any teacher's library! Contents include: Safari Stampede, Castles in the Sand, The Proud Prince, The (Almost) Late for School Toccata, Needle in the Hay, Yes! and Valse Élégance.